Chess tutors and coaches are always looking out for new material. I am pleased to report there is a new magazine aimed at juniors that is crammed full of excellent puzzles and problems. 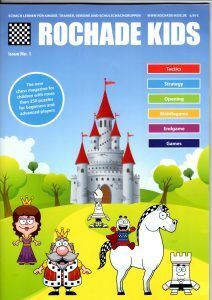 I first saw a copy of Rochade Kids – a new German chess magazine – while I was working at the 6th London Chess Conference. It was immediately eye-catching, which is the first job of all magazines, but it was the content which impressed me the most: 70 pages of superb and varied material, clearly presented and in full colour. The puzzles and problems cover a wide range of subjects, from checkmates, thinking ahead, pawn endgames. quizzes and lots of very instructive articles offering advice on a plethora of subjects. 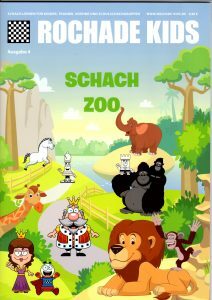 The Rochade Kids website is easy to navigate, even for those who know little or no German (Google will help with the translation). Issue 1 can be viewed here, in its entirety. A new English version is available too. Far from being a major inconvenience, the German language provided an extra learning opportunity when i tested out some of the material in my classes last month. The children embraced the challenge of learning a few new German words and wanted to learn more in subsequent weeks. I believe Rochade Kids has filled a significant gap in the world of chess literature and it is a publication I strongly recommend. Single issues and subscriptions can be ordered via the website.